I love these little indulgences. The filling is a great substitute for icky processed caramel which normaly contains high frustose corn syrup, refined sugars and others fillers. This is simply whole foods at their richest to treat your tastebuds! 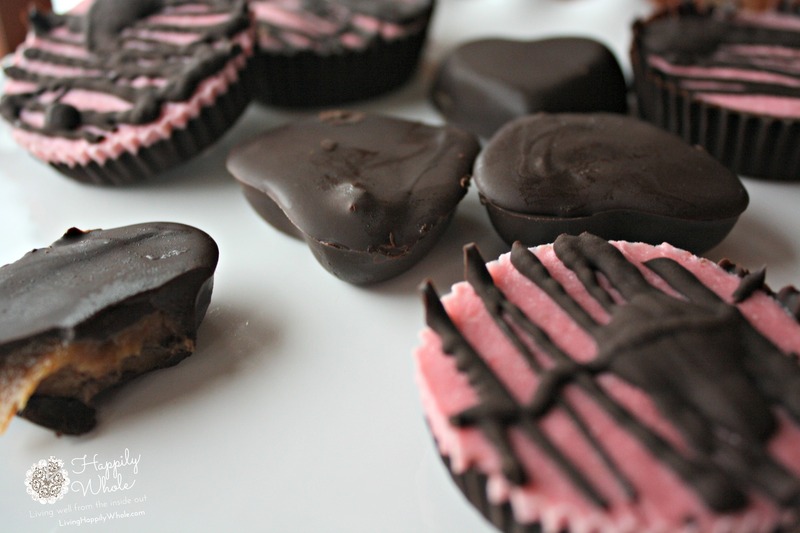 Read this post for how I choose chocolate for my candy recipes. I am a serious chocolate lover and so I don't skimp! In fact, I enjoy a bit (or more) every day! That's why it's so important that I am Choosy About My Chocolate! Soak the dates in warm water for at least a half an hour. 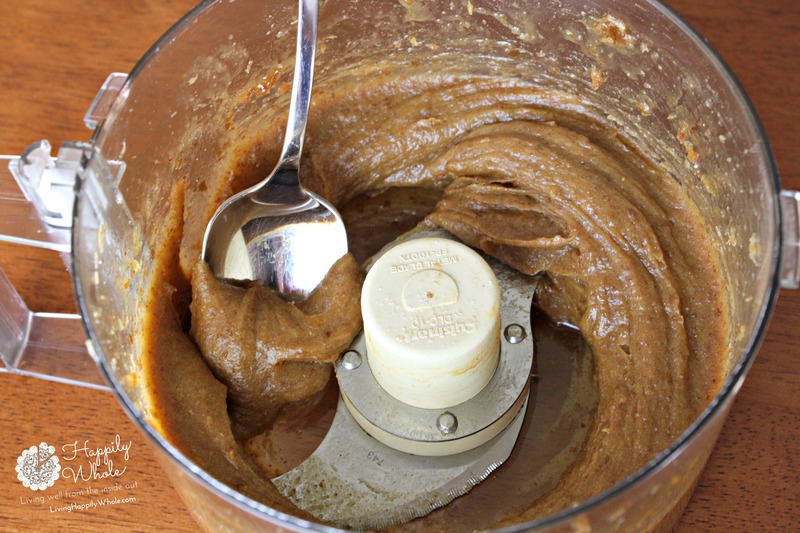 Put all of the ingredients for the 'caramel' filling into your food processor. Process until smooth. Put the chocolate and coconut oil for the shell into a double broiler on a low heat until melted, stirring frequently. If it gets too thick at any point, you can add a bit more coconut oil. You will need either candy molds or a mini-muffin tin lined with mini-muffin papers. 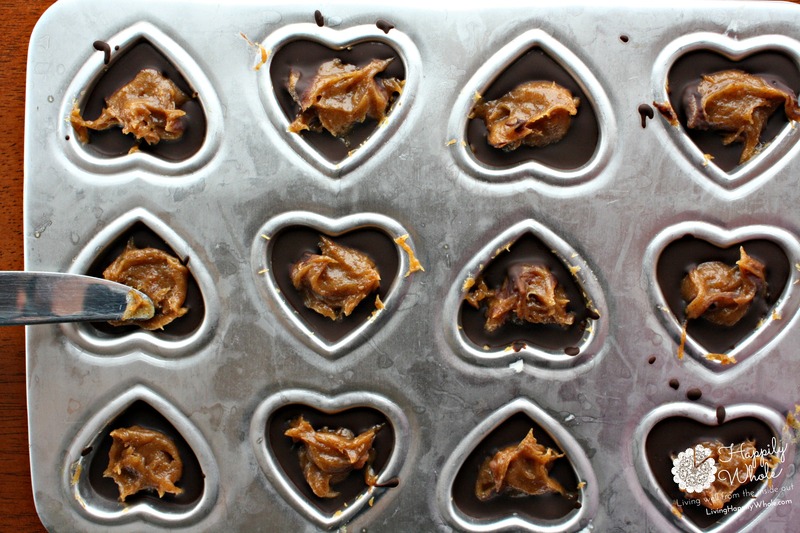 I used heart candy molds for Valentine's Day but I plan to recreate these in multiple shapes since they were such a hit! Spoon a small layer of the melted, warm chocolate into the bottom of your molds/papers. Dollop a bit of the filling into the warm chocolate so that it sinks in. I had to use my fingers to help since the filling is quite thick. Place the molds/tin into the freezer in a flat spot and let cool and harden for about 20-30 minutes. Remove from freezer and use a knife or fingers to spread and flatten the filling a bit. Spoon more warm chocolate over the top to cover the filling. 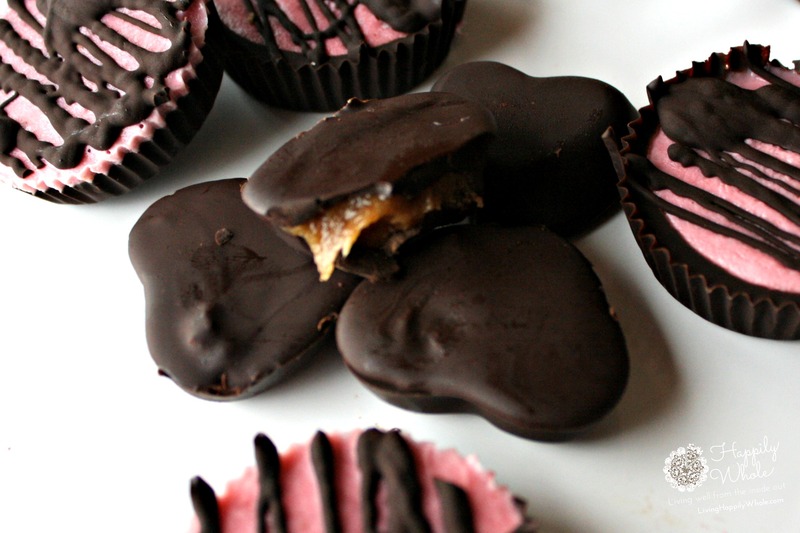 Place the molds/tin back into the freezer to allow the whole candies to harden. You can indulge in these right from the freezer when they are ready or you can let them sit out a few minutes to soften up a bit. I love them both ways!